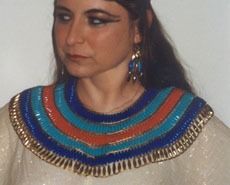 I'd always wanted an Egyptian broad collar, but the costume stores only had circular collars made of gold lamé with a few plastic "jewels" attached. Not at all what I had in mind! Besides, it would be fun to figure out how it was done. So, haunted by movie images of Elizabeth Taylor and Claudette Colbert as Cleopatra, and Anne Baxter as Nefertiri in The Ten Commandments, I set out for the bead shops. Of course, I bought far too many beads, since I didn't have any idea how many to purchase. So, being inventive, I decided to make some accessories as well. Photo by Carolyn Thompson. Click on the photo to see the costume in more detail. 19 millimeter spaghetti beads in royal blue, turquoise, red, and gold. Spaghetti beads are inexpensive, lightweight, come in strong bright colors, and are easy to see from a distance. Approximately 5 tubes of bugle beads. This looks like a lot, but remember that not all of the beads will be usable since some will be the incorrect length or chipped. Having already tried making a bead collar by gluing beads onto a circular piece of muslin, I had learned two things. First, gluing doesn't work because the finished item isn't flexible. Second, a purely circular shape doesn't work either because the inner edge cuts into the neck and the collar refuses to lie flat. Looking at a pattern for a round-necked collar, you will notice it has a somewhat oval-shaped neck opening, and the part that sits on the shoulders is flattened, so it is not truly circular. Okay, I knew that I needed to use a round collar pattern as a template. The next step was to try to figure out how to string spaghetti beads in parallel rows so that they would stay parallel. Certainly, a backstitch technique didn't work, since the beads refused to remain parallel and kept making a zigzag trim. While shopping later that week, I realized I was near a local bookstore and dropped in to see if I could find a book that would help. One of the helpful clerks showed me the trick: use two needles, one on each end of a long thread, with each needle passing through the bead in opposite directions. It's like making a continuous figure 8 pattern. Click on the image to the right to see this illustration of the bead stringing technique in more detail. The next step was to figure out how to arrange the colors. I studied my books on Egyptian art, paying special attention to the most inspirational one, Jewels of the Pharaohs by Cyril Aldred. The arrangements of colors that pleased me the most also produced the correct width: royal blue, turquoise, red, turquoise, royal blue, gold. The collar cannot extend beyond where the seam of a set-in sleeve would be; otherwise, when the wearer raises her arms the collar will not stay flat. I pinned my collar pattern to a blocking board and began stringing the inner row, royal blue. 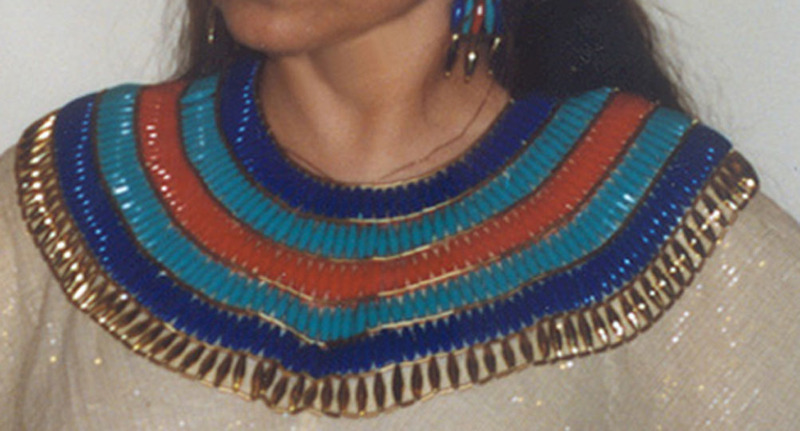 When I thought the row was long enough, I pineed it over the collar pattern, then added or removed beads as necessary and ended off. 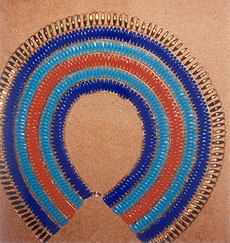 The second row, turquoise, was worked in the same manner. Then I laced them together loosely by catching the "connecting" thread between the beads using an overcast stitch. The next three rows were done in exactly the same mananer. Click on the photo to the right to see the collar in more detail. For the outside edge (Row 6) of 111 gold spaghetti beads, with the addition of spacer bugle beads, I used the name two-needle technique, but threaded a gold bugle bead onto each end of the thread before passing it through the spaghetti bead. Then I joined it onto Row 5 by passing the thread through a bugle bead and catching the connecting thread on the royal blue row. However, after I'd done this, the inner bugles didn't lie straight, so I passed a second thread through the row of bugles and pulled it just a bit tight. Then they were finally in a straight line and behaved themselves! In a similar manner, I added rows of bugles in the spaces between the rows of spaghetti beads. I threaded a bugle and caught the connecting thread. A second thread through the row of bugles was also necessary here. Finally, I attached a lobster clasp to one top back corner and a fairly large jump ring to the other. As mentioned before, I had purchased a few extra beads, so I used them to make a lotus flower headband. Click on the photo to see the headband in more detail. The stringing process goes twice around the headband. The first pass around, the spaghetti beads are placed in position with some of the bugle beads. The process of stringing the headband is best explained with diagrams. The first "lotus flower" is turquoise, the second is royal blue. Alternate these two colors until a total of 17 lotus flowers have been made: 9 turquoise and 8 royal blue lotus flowers. Click on the image to see the diagram in more detail. The second pass around, the remaining bugle beads are added along with seed beads. The two final single spaghetti beads are gold. To tie the headband together, use approximately 2 feet of 1-inch accordion-pleated gold ribbon. Since it has an elastic quality, it is great for costuming. Thread ribbon around the final beads and adjust to fit, tying ends in a reef knot. For each wristband, string together 8 strips of 9 spaghetti beads (using the same process as on the collar) in the following quantities: 4 turquoise, 2 royal blue, and 2 red. This produces a wristband six inches in diameter. 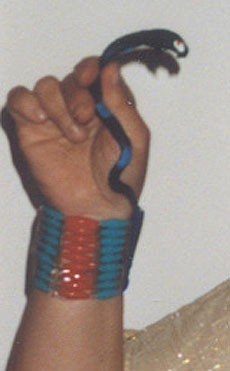 For a larger wristband, make two more strips, one red and one turquoise. Then join the strips together using beading elastic by passing the elastic thread through the hole in the spaghetti beads. The sequence of colors for a 6-inch wristband (T=turquoise, B=royal blue, R=red): T, B, T, R, T, B, T, R. For a larger wristband: T, R, T, B, T, R, T, B, T, R.
At the end of each round, pull the elastic a bit tight and tie a reef knot with the starting end of the elastic. Dab a bit of clear nail polish onto the knot, wait a few moments for it to dry, then carefully snip off the tails. Do not join the top and bottom rows at this time. For gold spacer bars, use 2-inch gold eye pins and thread 6 bugle beads onto each one. Then, using needlenose pliers, bend the end into a loop making sure that this new "eye" is parallel with the original eye. Finish joining the top and bottom rows, this time adding a spacer bar in between each strip of spaghetti beads. Upper armbands can be made in the same manner. For each armband use 8 strips of turquoise, 4 royal blue, 4 red, and 16 gold spacer bars. Sequence of colors is as follows: T, B, T, R, T, B, T, R, T, B, T, R, T, B, T, R.
Well, now I needed an appropriate dress to show off my hard work! I used turban fabric from an Eastern Indian store. This is a gauze, crinkled cotton that sometimes has tiny metallic stripes. It is wonderful for making broomstick skirts. I chose a natural-colored fabric with tiny metallic stripes in gold and silver. The dress itself was made using a peignoir pattern with an empire waistline. The bodice was roughly circular in shape with a U-shaped neck opening and the skirt was simply a plain tube. The tie belt is a long length of the same pleated gold ribbon that is used for the headband. The finishing touches? 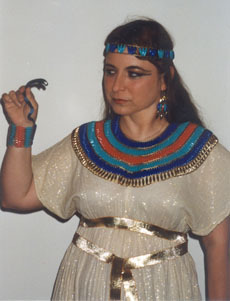 Gold thong sandals with upturned toes, lots of eye makeup, and a rubber cobra! This photo of Arabella was taken by Carolyn Thompson. Click on it to see more detail. This article originally appeared in the June 2000 issue of Needle Arts magazine. 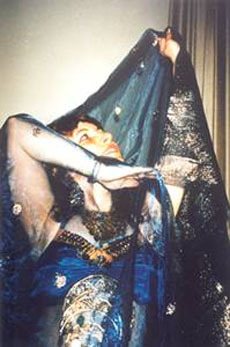 What Is Pharaonic Dance? Exploring the dance of ancient Egypt. How to Make a Cleopatra-Style Headdress. Via crochet, by Shira. Ancient Egyptian Art: An Introduction. Explains the meaning behind some of the more common images from ancient Egypt. Two-Dimensional Ancient Egyptian Art. Explanation of the artistic style employed by ancient Egyptians and the reasons for it. Ancient Egypt: Which Goddess Is Which? How to know which goddess you're looking at. Symbols From The Middle East. Pictures and history of many familiar symbols whose origins lie in the spiritual traditions of the Middle East. Poems Inspired By Middle Eastern History & Culture. 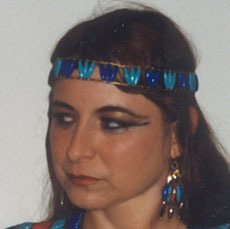 Several poems inspired by the ancient legends from the Middle East. Reviews of Books About Ancient Cultures. Reviews of books about Egypt and Sumer. 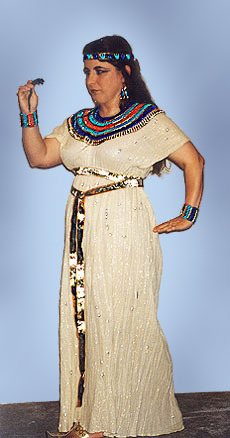 What Is Pharaonic Dance? An introduction by Shira.